"The whole, true and perfect security of the Christian religion resides in the Apostolic See." "What must be done in any given situation depends on the circumstances." It is true that general rules set forth a good which can never be disregarded or neglected, but in their formulation they cannot provide absolutely for all particular situations. "The negative commandments oblige always and under all circumstances." On the other hand, the fact that only the negative commandments oblige always and under all circumstances does not mean that in the moral life prohibitions are more important than the obligation to do good indicated by the positive commandments. The reason is this: the commandment of love of God and neighbour does not have in its dynamic any higher limit, but it does have a lower limit, beneath which the commandment is broken. Furthermore, what must be done in any given situation depends on the circumstances, not all of which can be foreseen; on the other hand there are kinds of behaviour which can never, in any situation, be a proper response — a response which is in conformity with the dignity of the person. Finally, it is always possible that man, as the result of coercion or other circumstances, can be hindered from doing certain good actions; but he can never be hindered from not doing certain actions, especially if he is prepared to die rather than to do evil. Saint John Paul II's teaching is straightforward: we are never permitted, under any circumstances, to violate a negative precept of the law, but there might be situations where we are excused from, or where it might not even be appropriate, to carry out a positive precept. The most common example for many of us is when we are not required to attend Mass on Sunday due to a serious illness. A more challenging example would be our obligation to proclaim the gospel. How often do we share the Good News of Jesus Christ with our family, friends and strangers? Nevertheless, there are circumstances when even proclaiming the gospel is not appropriate (e.g., a doctor treating a critically wounded patient in the emergency room should not initiate a conversation about the gospel with his nurses while trying to save the patient). These universal and permanent laws correspond to things known by the practical reason and are applied to particular acts through the judgment of conscience. The acting subject personally assimilates the truth contained in the law. He appropriates this truth of his being and makes it his own by his acts and the corresponding virtues. No, that is not an excerpt from Amoris Laetitia 303. It is how Veritatis Splendor 52 describes the practical application of the positive precepts through the judgment of conscience. The grace of God works also in their lives by giving them the courage to do good, to care for one another in love and to be of service to the community in which they live and work. It is a matter of reaching out to everyone, of needing to help each person find his or her proper way of participating in the ecclesial community and thus to experience being touched by an “unmerited, unconditional and gratuitous” mercy. Discernment must help to find possible ways of responding to God and growing in the midst of limits. In every situation, when dealing with those who have difficulties in living God’s law to the full, the invitation to pursue the via caritatis must be clearly heard. Fraternal charity is the first law of Christians (cf. Jn 15:12; Gal 5:14). Let us not forget the reassuring words of Scripture: “Maintain constant love for one another, for love covers a multitude of sins” (1 Pet 4:8); “Atone for your sins with righteousness, and your iniquities with mercy to the oppressed, so that your prosperity may be prolonged” (Dan 4:24); “As water extinguishes a blazing fire, so almsgiving atones for sins” (Sir 3:30). This is also what Saint Augustine teaches: “Just as, at the threat of a fire, we would run for water to extinguish it... so too, if the flame of sin rises from our chaff and we are troubled, if the chance to perform a work of mercy is offered us, let us rejoice in it, as if it were a fountain offered us to extinguish the blaze”. Naturally, if someone flaunts an objective sin as if it were part of the Christian ideal, or wants to impose something other than what the Church teaches, he or she can in no way presume to teach or preach to others; this is a case of something which separates from the community (cf. Mt 18:17). Such a person needs to listen once more to the Gospel message and its call to conversion. The divorced and remarried should ask themselves: how did they act towards their children when the conjugal union entered into crisis; whether or not they made attempts at reconciliation; what has become of the abandoned party; what consequences the new relationship has on the rest of the family and the community of the faithful; and what example is being set for young people who are preparing for marriage. Even if we focus narrowly on the commitment to continence imposed by Familiaris Consortio 84, the positive precepts are arguably more relevant as a practical matter than the negative precept to abstain from sexual relations. If a man and a woman seriously desire to commit to continence, they will not merely leave it to God's intervention to keep them from giving in to their sensitive appetites every night. They will take positive, concrete steps on Earth to reduce the risks of falling into sin. These positive steps could include sleeping in separate rooms, drinking less, wearing more modest clothing in each other's presence, and spending less time alone together. What must be done in any given situation depends on the circumstances. In the case of a couple where only one person desires to live in continence, the application of the positive precepts becomes much more complicated. The most basic positive precept would be the obligation of the person to inform the other partner in the union of his or her desire to live in continence. Must a divorced and remarried Catholic, in every situation, regardless of the circumstances, inform his or her partner that he or she desires to live in continence? Veritatis Splendor 52 tells us that the answer is NO: "Only the negative commandments oblige always and under all circumstances." When there is no positive step on Earth that is reasonably likely to avoid situations in which a man and woman who are attracted to each other are likely to fall into sin, we can say that a commitment to continence is not feasible. Yes, it is always possible with the help of God's grace to avoid committing an intrinsically evil act. But it may not be feasible to take any positive, concrete step on Earth that is likely to meaningfully curtail the sensitive appetites of two people in immediate proximity to each other every day and night of their lives, aside from prayer and ... the sacraments! Yes, the Sacrament of Penance restores sanctifying grace and the Sacrament of the Eucharist infuses the recipient with even more sanctifying grace and curtails concupiscence. For two people (or one person) in a situation where they cannot think of any Earthly means of avoiding sin, the Church offers the sacraments of Penance and the Eucharist as the source of God's help for their struggle against sin. Every good Christian ought to be more ready to give a favorable interpretation to another's statement than to condemn it. Pope Francis is not shy about changing Church teaching when he wants to. He came right out and did it this year with his revision to the Catechism's teaching on the death penalty. He has never hinted, in any of his speeches, homilies, or documents, that the Church's teaching on the negative precepts of the law should be changed. He has never suggested anything of the sort. 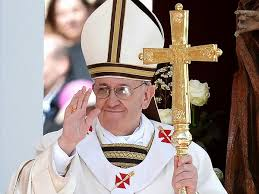 The only people who have suggested that Pope Francis wants to change the Church's teaching on the negative precepts of the law are (1) his critics and (2) people who themselves want to change the Church's teaching on the negative precepts of the law. What has that got to do with the Pope? The duty of Catholics is to listen to the Pope, not his critics and not those who want to change the Church's teachings to suit their own desires. Has a Pope ever taught heresy?